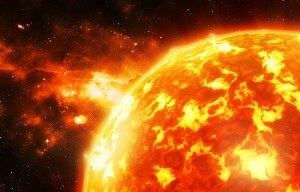 The new EU H2020 project ‘AIDA’ will use AI in space physics, studying data from space like data from sun flares. Picture: Shutterstock. The EU H2020 project 'AIDA' on using artificial intelligence in space physics was signed this week (May 2018). The Multiscale Dynamics Group at CWI is one of the eight research partners involved. The ultimate goal is to create an intelligent system that enables new scientific discoveries in space physics. Artificial intelligence (AI) is rapidly changing our way of living. We use it every day, and often we do not even realize it. Every time we search for an image on Google, we make an online purchase, we are recommended to watch a movie on Netflix, or to buy a book on Amazon; every time we use social media or a translator app, an AI algorithm is used. The field of AI that deals with discovering patterns, learns how to reproduce certain behaviour and how to associate images or texts with ideas is called Machine Learning. The basics of it has been known for a few decades, but only recently the unique combination of big data availability and cheap computing power has allowed ground-breaking results. Machine Learning is now teaching world champions new strategies in the game of Go, and it won’t be long before driving a car will be a curiosity of the past. AIDA (Artificial Intelligence Data Analysis) is a scientific project coordinated by Prof. Giovanni Lapenta at KU Leuven and funded by the European Community, as part of the Horizon 2020 program (COMPET-4). AIDA has a total cost of 1.5 million euro and involves researchers from universities and companies in 6 countries: Belgium, Netherlands, France, Italy, Greece and the USA. This interdisciplinary collaboration will be devoted to artificial intelligence, applied to the analysis of space data. The contribution of the Multiscale Dynamics group at CWI will be in developing software for classifying and detecting interesting events. This will allow to create ‘catalogues’ of pre-processed data that can be used for further investigation from space scientists. The code will analyze a huge amount of data coming from all the satellites in our solar system. The intent is to create, in fact, an intelligent system that first reads what is available in open ESA and NASA repositories and then processes it to bring about new discoveries scientific, reveal any anomalies and recognize structures. AIDA will do the ‘dirty’ work of rummaging through huge databases of information, relieving researchers from the time-consuming task of manually analyzing the data. Our avatar will also alert us to possible extreme events, potentially dangerous for satellites and for astronauts. AIDA will be a product aimed at everyone, built in an open source programming language (totally free), Python (originally made by CWI). This choice of ‘free artificial intelligence’ will greatly reduce the costs of research, making science accessible to everyone - as it should be. The code will work in a virtual environment, exploiting powerful supercomputers at the Flemish Supercomputing Center in Belgium and the the CINECA Supercomputing center in Italy. Having access to the largest databases made available by ESA and NASA, AIDA will collect information and discoveries, cataloging them on a free cloud storage system.